D. Ternois, 'Le Martyre de Saint Sébastien, de Jacques Callot' in Pays Lorrain, 1954, pp. 46-49, illustrated. D. Ternois, Jacques Callot. Catalogue complet de son oeuvre dessiné, Paris, 1962, no. 1173, p. 153, illustrated. Paris, Lorraine Marche de France. Deuxième centenaire du rattachement des Duchés de Lorraine et du Bar à la France. 1766-1966, 1967, no. 164. Florence, Palazzo Strozzi, Il Seicento Fiorentino, 1986-7, no. 2.148. Nancy, Musée historique lorrain, Jacques Callot, 1592-1635, 1992, no. 634. The first of a series of three preparatory studies for the etching of the martyrdom of Saint Sebastian dated 1632-3 by D. Ternois, 1962, op. cit., nos. 1173-1175. 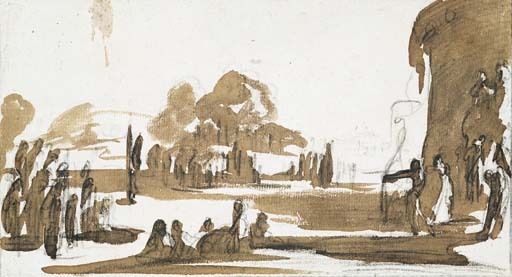 In the present drawing the artist sketches the broad outlines of his composition. Marco Chiarini wondered if Callot had sought inspiration from his friend Filippo Napolitano, who had painted a similar composition for Grand Duke Cosimo II's private apartments at the Palazzo Pitti. However, the early Lorraine watermarks found on the paper which was used for the earliest impressions of the etching now in The Hermitage suggest the opposite. The other two surviving preparatory studies reveal an increasing degree of definition in the details of the composition. The second sheet is in the Crocker Art Gallery, Sacramento, and third, the finished modello, is in the Victoria and Albert Museum. The etching is considered one of the artist's masterpieces, and was described by Mariette as 'une des pièces les plus parfaites de l'oeuvre de Callot'. Saint Sebastian was frequently invoked during the plague which, as has Ternois pointed out, had killed the artist's father in 1631.